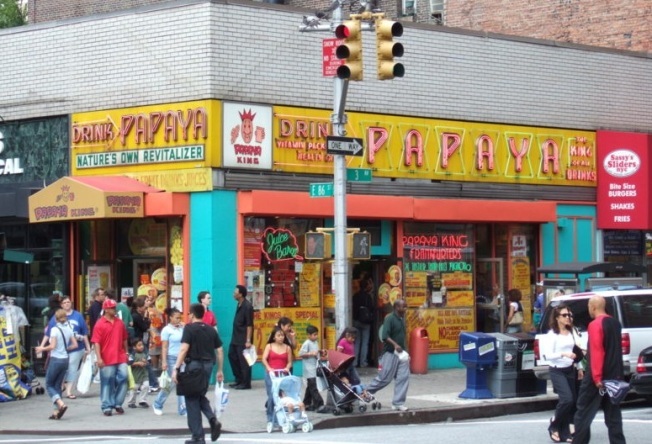 If there's one thing Gray's Papaya and Papaya King can agree on it's that a proper New York hot dog should come slathered in red onion sauce. The sauce is as much a part of NYC as skyscrapers, manhole steam and the Hudson River, so you'd be forgiven for thinking the Dutch settlers found it just burbling up out of the ground. Of course, it didn't happen that way. The version we are all familiar with, made by Sabrett's was the invention of Alan S. Geisler, who passed away in Florida last week at the age of 78, and concocted the magic recipe, with a base of vinegar onion and tomato paste, more than 50 years ago. His invention, one New York hot dog aficionados surely rank among the most important culinary advances in modern times, will live on. Before Geisler, a food technologist trained at MIT (how's that for bringing a bazooka to bee-bee gun battle? ), hot dog vendors in the city had a version of the topping that they mixed by hand. The spread of the red onion sauce necessitated, of course, the invention of Tums.